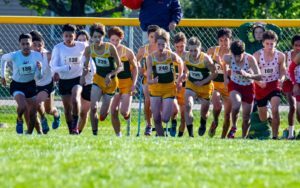 OSWEGO – The Waubonsie Valley boys cross country team will get a chance to come home on Saturday to compete for IHSA Sectionals after a 5th place finish at Regionals in Oswego on Saturday. The Warriors tallied 120 points, just five behind 4th place Naperville North. Sophomore Zach Benzinger lead the team with a 15th place finish in 16:00. Junior Jackson Bukala (22nd), senior Alex Barenbrugge (26th), junior Wes Beitler (28th) and senior John Caron (29th) followed. IHSA Sectionals are on Saturday at 10:00 a.m. at Waubonsie Valley High School.